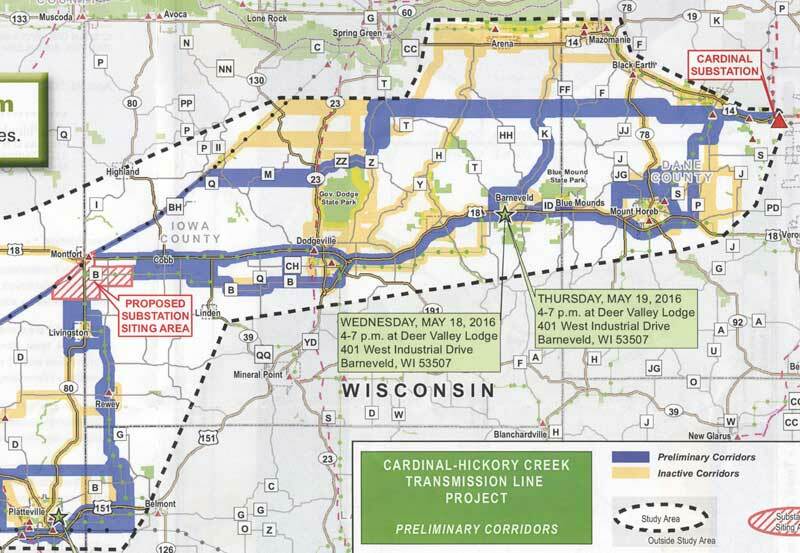 ATC, the American Transmission Company, which operates high-voltage transmission lines from giant towers in Wisconsin, is in the process of deciding a route between a major site called the Cardinal Substation (off US 14 on Willow Lane, 1.6 miles mile west of Pleasant View Road in Middleton) and a proposed new substation south of Montfort on the edge of Iowa County. There are two possible routes, both of which go west from the Cardinal Substation to Cross Plains. From there, one goes south on County P to US 18/151 and then west along this "super" highway to Iowa County. The second route charges due west across the Town of Cross Plains and the Town of Vermont, and goes directly across Pleasant Valley Conservancy State Natural Area! Using GIS, I scanned the ATC map of the route through the Town of Vermont, georeferenced it, and overlaid it on my map of PVC. As the map here shows, PVC is completely inside the power line corridor. 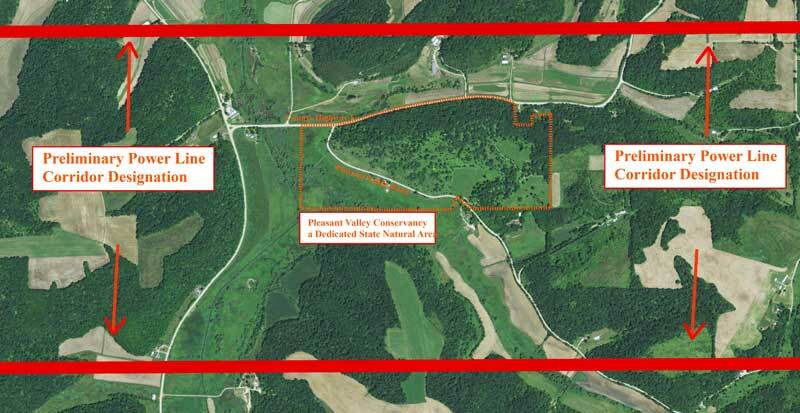 Map showing the location of the "corridor" that crosses over the top of Pleasant Valley Conservancy. The map provided by ATC was scanned and georeferenced so that its boundaries could be mapped. Those mapped boundaries are shown crossing north and south of PVC. Where would the giant towers be? Naturally, we will be providing ATC with all the information we have on PVC, including maps, species lists, and boundaries. Most especially we will be pointing out the large number of ancient bur oaks that are present, some having their origins in colonial times. I'll have more to say about this power line situation later. Naturally, Kathie and I will be attending the public meeting to be held Wednesday May 18, 2016 from 4-7 PM at Deer Valley Lodge, 401 Industrial Drive, Barneveld 53507. Hopefully, people from TPE and others interested in preserving ecologically sensitive lands will also be attending.